Order Al’s Goodie with the paypal button on the Shop page on this site. Goodies are $3.00 plus $2.00 for postage in the US. 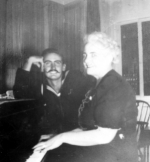 The photo here was taken of Al with his mother, in 1945.